Now the days are longer and lovely twilight has come again into the world. In winter we seem to high-dive from day to night, but now the violet dusk folds over the valley so gently and the sky is luminous so long. ... to 10 inches of snow!! The daffs in the blog header were in front of the stone planter. Good thing we picked them! Poor lilacs. I went out with a broom and got the heavy snow off. They sprung back so I'm hoping they are alright. There's a giveaway going on through Sunday! Arbor Day Square by Kathryn O. Galbraith - GIVEAWAY! Not only is this a lovely book, beautifully written and illustrated, it is also an important book because it introduces Arbor Day to young children. I am quite sure that I learned about it through reading 365 Bedtime Stories when I was a young girl. I wrote about this book last May 1, and here I am almost a year later, spotlighting it again. At that time, in that locale, Arbor Day was April 20. My Old Farmer's Almanac calendar says April 30 is National Arbor Day, and though the last Friday in April is the most common date, it varies from state to state according to the best planting time for trees. There is a nice note at the end of Arbor Day Square telling all about the origins of Arbor Day and how it has spread to countries around the world. If you'd like to read more about it, there is a terrific website. I was so very pleased when the publicist for Arbor Day Square wrote to me and asked if I would like a copy. The story is simply and beautifully told of a young girl and her father who have moved out to the midwestern prairie. The town is growing steadily with stores and a church and a schoolhouse, but there aren't any trees. The townspeople raise money to order trees, and when they arrive, trees are planted all over town. There is one tree which is very special to Katie and her dad. I love books which show the passage of time as this one does. We see the little girl impatient for her tree to grow, then watching as both she and the tree get older, and then she has a little girl of her own. Lovely in every way is this book. A perfect book for someone with a new baby, or a new grandchild, or for yourself if you love picture books as I do. The best ones tell deep truths in the most beautiful way. May Arbor Day Square encourage the love of trees to a whole new generation. And now for the best part - I have a second copy to offer as a giveaway!! Please leave me a comment on any post letting me know you would like to be entered in the draw from now through Sunday, May 2, and I will do a drawing on Monday, May 3. I will send it anywhere in the world. If you've read my letters for a while, you may have picked up two things about me. One is that I am not a particularly fast reader. I seem to stay steady at four-six books per month depending on kind and length of book. And two is that I tend to shy away from disturbing subject matter. Well, as they say, rules are meant to be broken. I couldn't put this book down. I began on a snowy Friday afternoon, and finished just after midnight on Saturday morning, with breaks for supper and watching The Beiderbecke Tapes (which I love). And the book is full of all sorts of incidents, descriptions, horrors that I usually cannot read. I thought it was excellent despite a number of quite appalling situations. The story begins with three incidents: the murder of a man in his late sixties, an assault on elderly twin sisters, and the disappearance of a new bride from her wedding reception. Are they connected in any way? Incidents from forty years ago come into play. Inspector Erlendur Sveinsson is around fifty years old, divorced, eats poorly, and has troubles with his family. His son has been in rehab several times, and his daughter is an addict. He blames himself because he left the family home when she was very little. But the way she speaks to him! She makes Major Pettigrew's son seem angelic in comparison. :<) The writing, and the translation, are simply excellent. It reminded me a bit of Hemingway. He took his meal out of the microwave and sat at the kitchen table. It was a one-bedroom flat filled with books wherever there was any room to arrange them. Old family photographs hung on the walls showing his relatives in the East Fjords, where he was born. He had no photographs of himself or of his children. A battered old Nordmende television stood against one wall with an even more battered armchair in front of it. Erlendur kept the flat reasonably tidy with a minimum of cleaning. A movie has been made but isn't yet available in the US. I have it in the saved section in my Netflix queue. I can imagine this story would make a fantastic movie. My only acquaintance with Iceland previous to this book was the film, The Girl in the Café with the always excellent Bill Nighy, and a favorite actress, Kelly MacDonald. It made Iceland look so very appealing to me. The author has a note at the beginning about Icelandic names which is fascinating, and there are great maps at the front of the book which were very helpful. The country, the names are all so new to me, and I so enjoyed my time in Iceland. The minute I finished Jar City, I ordered the next two in the series from The Book Depository. That's the highest praise I can give a series. I can't wait to continue, and I even might read this one again because it was so, so good. There's an interview from four years ago with Arnaldur Indridason here. The daffodils are the stars of the garden these spring days. That's garlic you see in the raised bed. Little hyacinths from Old House Gardens are up in another raised bed. At my request, Tom has cut down all the Rosa rugosas just outside the kitchen door. I planted maybe four plants a few years ago, and they had taken over the whole area. I like roses but there were just too many. I already see things popping up which have been hidden - iris, mountain bluet, and lupine. It doesn't look very attractive now, but once the flowers spread, and I plant some others there, it shall be beautiful, I'm sure! We've been talking a lot about what we want to do just outside the kitchen door. We now have two granite slabs for steps and then grass with some stepping stones. The sidewalk is made of little pebbles which are almost completely covered by grass now. We need to put some pavers down as a sidewalk, just like the patio (scroll down to fourth picture on the page). But do we have a patio off the kitchen too, or do we build a wooden deck? A lot of people say a deck just doesn't go with an old farmhouse, but I'm still thinking it could be nice. I'm open to any ideas you would like to offer! This summer we are going to replace both doors, and paint the new ones the same as the front door. We get our honey in large buckets from Honey Gardens, and after they are empty Tom uses them for various things. This week, he filled one up with water to dissolve the honey and clean it out. As the water sat, all kinds of insects were attracted to the sweetness, including this bumblebee. The rhubarb has leaved out and stalks have poked through the soil. And lastly, here's a good reason to keep the tag on a plant you aren't too familiar with. I bought a tree/shrub last year and planted it between lilacs and an old honeysuckle near the vegetable garden. This year I wondered what it was. And then I saw the tag! The quality of the photos isn't very good this week, but I took most of them in the brightest sun of the day, and didn't adjust the camera at all. Betsy and Tacy and Tib were three little girls who were friends. They never quarreled. "It's too bad! Betsy Ray and Tacy Kelly always played so nicely, Two little girls often do play nicely, but just let a third one come around...." And they stopped, and their silence sounded as though they were saying: "then the trouble begins!" But although many people expected it, no trouble began with Betsy, Tacy and Tib. The three of them didn't quarrel, any more than the two of them had. As I finished my second in the Betsy~Tacy series, I realized that my book reports through the coming months on these books won't vary much. These are sweet books; they are pleasant books. They make the reader feel good about the world. bacon grease, ginger, milk, tapioca, coffee, molasses, and bay leaves. They end up throwing it out after tasting, and then clean up the whole kitchen. Little incidents such as this may not make for exciting reading to some, but I greatly enjoyed the book, and I had a smile on my face as I read. I adore these books as much as I did when I was a girl reading them, and when I read them to my own daughter. This is my fourth book in the You've Got Mail Reading Challenge. The others are listed on the sidebar and you may click the titles if you'd like to read my book reports. A wonderful movie, and a wonderful set of books. I highly recommend them for you or for the young girls in your life. I've always told my children that waitresses and people who clerk at grocery stores and people at the front desks of businesses have very important jobs. They can make the difference in someone's day. When I was a new mother there were days when the only people I talked to were in the grocery store. I still remember the kindness, the genuine interest in my new baby from South Korea, the tales of their own children. They gave me a great gift when I was feeling insecure in my new job. They warmed my heart with their affection toward my girl. Long before kids, Tom and I used to go to a diner in a nearby town. 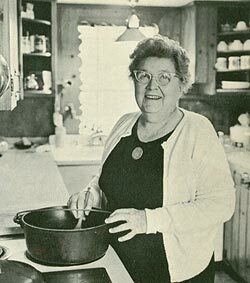 When Margaret came along, this was her first restaurant. A waitress waited on us, whom we had known for a while. She was originally from Japan. She grinned and told us the baby looked more like her than us. I still laugh when I think of it. Another waitress in the same place somehow got on the subject of high school poetry, and before we knew it, she was reciting the whole of Jabberwocky by Lewis Carroll. And later when our son went to school in that town and we would meet him and his girlfriend at the same diner, 'our' waitress knew what we always ordered. These are just three little incidents but in their way, they exemplify all diner waitresses everywhere. I think these women are heroines. I think they are noble. I think they provide a much needed, and often unacknowledged, job in this world. They listen. They care. They give solace to the lonely. They bring humor and conversation to the sad. And Counter Culture celebrates these women. These women aren't called 'servers.' And they are never men. This is a realm when women rule. They may not be the owners, they may not get paid CEO wages, but the diner is theirs in so many ways. Counter Culture is full of photographs and stories. Candacy A. Taylor does a wonderful job of writing about the general, leading into the specific. She'll tell about a facet of the job and then illustrate it with the words of a waitress. There are also profiles of individual waitresses. Carrying is her lifeline. The fewer trips she makes, the faster she can turn her tables, the more money she earns. Experienced waitresses can carry four to six cups of coffee at a time. Geri Spinelli, who works at the Melrose Diner in Philadelphia, said, "It's easy. You just pile one cup on top of the other. But you have to work in a place that still uses saucers so that they fit together." One customer who comes to me knows that he'll get fresh coffee. Some waitresses will make several pots at a time. They don't care if the coffee sits there for hours and gets stale. Or they will mix old coffee with a fresh pot. I tell the other waitresses, 'Don't touch my coffee pot.' I have a regular who comes in everyday at 5 am and he drinks decaf, so I don't make any decaf until right before he comes in so he gets a fresh cup. That's important. Also, I warm the cup for my special customers because it's the first cup that they look forward to. Most people don't understand what we do. Waitressing is a dying art. We learn the history of waitressing, the economic realities of the job, the difference between older and younger waitresses, and about the people who frequent diners. I spent a long time on each page, digesting the words and looking at the photographs. It is an historical study, a sociological study, and a study of America, past and present. These waitresses are aging and younger women are not taking their places. The 'regulars,' the mostly older men who come in, will not be replaced by younger men. Although there will always be women who will wait on tables their entire lives, will there always be lifers who love their jobs? Faye Blackwell of Washington, D.C., doesn't think so. "I think waitressing is simply going to be a means for girls to earn money to get through school or some crisis. I don't think society is geared toward this anymore. If you notice, you rarely see old servers today and a lot of that has to do with the restaurants: they want the young ones. They think that beauty attracts business and I know for a fact that it does not. People go to diners because they want to feel at home." Jodell agrees. "The younger generation will never truly appreciate waitressing," she said. "It's gone. It's just us older, war horses." Not only will waitresses change, but the customers will be different as well. Most career waitresses say that men make up 75 to 90 percent of their clientele. Many are widowed and don't know how to cook for themselves, so they rely on the diner for their meals and come in three times a day. As this generation of men pass away, their sons will bring a new element of independence that their fathers didn't have. It's more likely that men of this younger generation will be single, either divorced or never married. In any case, they will probably know how to cook for themselves and will not go to a restaurant for every meal. As the decades pass, this new generation of customers will be very different from the typical regulars that waitresses serve today. If you have ever waited table, or if you are a 'lifer,' or if you've ever eaten at a coffee shop, a diner, or if you never have, you ought to read this book. It is informative, fascinating, warm-hearted, and entertaining. I've never read anything like it. I hope it becomes a huge bestseller and allows these women to be appreciated for all they do in this world. Here is a review of this book by Citizen Reader. On Monday I saw a swallow investigating the nesting box on the telephone pole which these birds use every year - sort of like when the swallows come back to Windy Poplars. The little Scilla siberica (Siberian squill) are up which I got a few years ago from Old House Gardens, a truly wonderful company. Vast pools of this true blue wildling decorate many old neighborhoods in very early spring, spreading without care under shrubs and into the lawn in light shade. Grown in America by 1830, its heyday was the early 1900s when one writer recommended planting “hundreds and thousands in every garden.” 4-6 inches, zones 3-7, from Holland. The daffs are really out now. We have a whole area of them and they come at intervals. The dear sunshiny flowers took a beating as we had snow Thursday night into Friday morning. They look a little better today but I think I'll pick them for a bouquet. There was a mix of snow and rain most of Friday. Today it has stopped but still cloudy and cool, in the upper 30s. As I look outdoors, it appears like a green picture with bright white matting. Really quite lovely. When dandelions bloom, plant spinach, beets and carrots. When lilac is in full bloom, plant beans. Once lilac flowers have faded, plant squash and cucumbers. When lily-of-the-valley blooms, plant tomatoes. I absolutely love information like this. And I love the idea of planting according to moon phases, as my grandfather did; for example, planting crops that grow below ground during a waning moon. There are a couple fun sites you may visit to find out more about this fascinating subject here and here. We have done this a few times but haven't kept records. Maybe this year we'll pay better attention. This is only my second writing about a Rex Stout mystery. The first was a book report on A Right to Die. Most of my reading of the Nero Wolfe/Archie Goodwin mysteries happened before I began this blog. I've actually read more than I can count. I am unendingly fascinated by these two and what is currently going on in their lives. I don't really care that much about the mysteries, but I do care about these characters. They are to my mind the most intelligent of all sleuths. A few don't end quite so well, particularly Stout's last Nero Wolfe novel, A Family Affair. Written at the height of the Watergate scandal, it's probably the darkest of the Wolfe stories; Stout, a deeply patriotic man who often subtly worked his concerns about American life into his mystery plots, seems to have been writing under a cloud of anger and frustration at the corruption revealed in the Nixon administration. His death soon after left the book a sour and unexpected ending to his best creation. The books are narrated by Archie, and he describes the old brownstone on West Thirty-Fifth Street in such detail, I feel as if I've been there. The red chair, the yellow chairs, the desk, the globe, the kitchen, and those books! There is a list of all the titles in Wolfe's library that fans have collected from reading the mysteries. I divide the books Nero Wolfe reads into four grades: A, B, C, and D. If, when he comes down to the office from the plant rooms at six o'clock, he picks up his current book and opens to his place before he rings for beer, and if his place was marked with a thin strip of gold, five inches long and an inch wide, which was presented to him some years ago by a grateful client, the book is an A. If he picks up the book before he rings, but his place was marked with a piece of paper, it is a B. If he rings and then picks up the book, and he had dog-eared a page to mark his place, it is a C.
If he waits until Fritz has brought the beer and he has poured to pick up the book, and his place was dog-eared, it's a D.
I haven't kept score, but I would say that of the two hundred or so books he reads in a year not more than five or six get an A. It is features like this which make each and every book a pleasure to read. I've mentioned that my holy trinity of writers is P.G. Wodehouse, John Mortimer, and Rex Stout. A great joy to me is that Stout and Wodehouse read one another. Of course Wolfe, up in the plant rooms on the roof for his morning session with the orchids, hadn't seen her. Most of the people who enter that office for the first time have something eating them, but even so they often notice one or more of the objects in view - the fourteen-by-twenty-six Keraghan rug or the three-foot globe or the floral display in the vase on Wolfe's desk. Archie is a great walker, keeping him trim as he eats the same great meals, which Fritz the chef prepares, as Wolfe. Archie goes out dancing, he goes to baseball games, he drinks milk more often than liquor, and in his own way is as much of a genius as Nero Wolfe. He can quote long interviews with clients verbatim. He is very observant. Wolfe sits in his chair, takes the elevator up to the plant rooms, and sleeps. He loves his thousands of orchid plants, he loves his books, and he loves his food. Probably now he would be labeled an agoraphobe, but he actually does leave the brownstone more often than we readers suppose. He would also probably be labeled an obsessive-compulsive. And he would be criticized for eating (and maybe drinking - he is a big fan of beer) too much. However, all these facets of his personality are what make him an excellent detective, a superior thinker, and a fascinating character. We love him even as we see what a curmudgeon he can be. He isn't bland. He isn't boring. He is one of the greatest literary creations ever. Oh, and the plot of this book: well, when a businessman opens a drawer, a bomb goes off and kills him. Besides the question of who placed it there, there is the problem of whom the bomb was intended for. The desk didn't belong to the man who was killed. He merely opened the drawer. There are professional and personal intrigues which must be sorted out before the murderer is discovered. It's a fine mystery, but as I say, it really isn't of prime importance, though I should note that the mystery in each book is finely crafted and cleverly solved. Compose yourself, Archie. Why taunt me? Why upbraid me? I am merely a genius, not a god. If you've been reading my letters for a while, you will know that I love the Kinks, and in particular Raymond Douglas Davies. My great blogging friend and fellow Kinks fan, Laura sent me The Kinks Choral Collection (featuring the Crouch End Festival Chorus). This is my thank you note to her! I've given myself a gift. The gift of a yoga room. With both kids living away from home, I have pondered just what to do with their bedrooms. I realize that some households keep them as bedrooms; even their bedrooms, with childhood/teenage things in them. They are useful as guest rooms, and as places for the adult children to stay when they come home to visit. I'm in a bit of a different situation because both my kids live nearby: my son lives about an hour away; and my daughter is in the beginning stages of building a house on our land. Thus, I don't need these rooms for them to stay in. We don't have many guests come from away, and when they do come, we get them a room in a bed & breakfast, or rent them a house. It is just too much of a hassle because of our one dog, Sadie, who as I've noted before, likes only four people. She protects us from the rest of the world, and we cannot take a chance with the aggression she shows toward strangers. So, I have two rooms to play with. The north room at the back of the house is now a walk-in closet. This old farmhouse is sorely lacking in closet space so this is just perfect! We have clothes racks for shirts and dresses. We have one bureau and one set of open shelves. I have a few tubs in there of baby clothes and old photographs. I also have a floor to ceiling shelving unit which holds all the photograph albums. Lastly, this is where the litter pan and cat food bowls are. The south room is now a yoga room. Not a yoga room in which I play my yoga dvds, but a room without any television or dvd player. This space will be used for quiet yoga. The only things in the room are a small chair which holds my three yoga books, a little wooden stool for a candle, and my mat. That's it. The walls need paint and the floor needs sanding but for now it will do fine as it is. I can go in, close the door, and practice yoga in complete peace and quiet. I am so very happy about this. It's been a long time in the thinking stage, and now it is a reality. The day I wrote the last Farm and Garden Weekly, the temps were in the mid-eighties! Amazingly wonderful day. But it ended by me finding a tick crawling on my hand as we watched The 39 Steps (television version - which was great by the way). Thank goodness it hadn't attached yet. I grabbed it with a kleenex, threw it in the woodstove and burned it. Yuck! One good day and they are already a problem. We came home from an Easter supper and heard peepers! If you aren't familiar with this dear sweet sound of spring you may listen here. The first daffodil has blossomed, about three weeks early. The lilacs are budded out and are also early this year. The spiderwort is up. If you are a new reader of my letters, you may enjoy this earlier posting about the proper pronunciation of this wonderful plant. How I love Henry Mitchell! The monkshood in the corner of the terrace garden popped up this week. When I was a girl my friend and I used to cross the footbridge near our houses and go to her grandfather's house to get sweet peas. I fell in love with the delicate colors and beautiful fragrance. This morning I ordered my sweet peas from Renee's Garden. Blooming in dainty salmon-rose and soft mid-blue, our perfumed duet grows just 3 feet tall. These nostalgic and charming flowers bloom early offering heat tolerance and strong garden performance. The first named sweet pea cultivar, dating from 1737. Painted Lady is a beautiful rose, pastel pink and cream bicolor that is deliciously scented and heat tolerant. Begins flowering early. An especially strong blooming strain of the first cultivated sweet pea. Perfumed, heat-tolerant and beautifully bi-colored in deep maroon-purple and orchid-violet. Note: Sweet pea pictures from Renee's Garden. Although last night into this morning we had snow showers, the snow didn't stay on the lawn. For most of the week we've had nice spring rains that smell so very good. It has been cool enough most days to keep the woodstove going, but outside is green, green, green. When you are a new parent, and if you are a reader, you will probably buy books about raising children. I found Dr. Benjamin Spock, Penelope Leach, Barry Brazelton, and the Ames & Ilg books that go year by year to be the wisest of counselors as I navigated this new territory of parenting, without a mother's guidance. They helped me through. They gave me confidence and humor. They made me feel like I could do this most wondrous work of bringing up children. When children become teenagers, there are still many guidebooks to give aid to worried parents. But once they go to college, or begin working, or join the military, there are no more books. The only phrase I've ever heard is 'the empty nest.' Well, yes, perhaps physically, but definitely not emotionally. I've found the years since my children graduated from high school to be the most trying, nerve-wracking, and rewarding of my life as a parent. And no one tells you. At least in my experience, there is no one writing about how to cope with adult children. Even the two words 'adult' and 'children' offer a clue to the difficulties. They are still our children, but they have become adults. After a surprising coincidence, when I found myself reading this book, and watching the movie, Everybody's Fine, I began to think that perhaps literature and film may fill the gap and offer direction, because both of them deal with the subject of parents and adult children. Not only parents, but single father parents. I found it incredibly serendipitous. When there are adult children, there are also aging parents. Of course, not everyone is old when their children are grown but those of us who waited until our thirties to have these children suddenly find ourselves in our fifties or sixties. So, not only are we coping with our little babies all grown, but we are coping with the physical and emotional changes that come with older years. In Everybody's Fine, Robert De Niro has a lung problem, for which he must take medication. His wife has been dead for several months and he wants to get all his children together. He finds in the course of the movie that things are not as he thought they were. At one point one of them tells the father that they don't tell him the truth about their lives. In Major Pettigrew's Last Stand, the Major at sixty-eight is still in quite good physical health, but is lonely since the death of his wife six years earlier. He has just one son, but honestly that 'boy' felt like he was ten children. He was so incredibly self-absorbed, unkind, thoughtless, and selfish. He absolutely drove this reader crazy. His father loves him, and tries his best to make him happy, but that son does nothing in return. So that is one facet of this excellent book - the father and adult son relationship. Another dimension of Major Pettigrew's life is a growing interest in a widow who keeps a grocery store in the village, Mrs. Ali who is ten years his younger. And she has her own troubles with the younger generation; not her children but her nephew who has moved in to the small quarters above the store, and tries to take over her life. "It is a fact of life, I suppose, that the younger generation must try to take over and run the lives of their elders," said Mrs. Ali. "My life is not my own since my nephew came to stay. Hence, the dream of a cottage of my own has reawakened in my mind." "Even in your own home, they track you down with the telephone at all hours," said the Major. "I think my son tries to organize my life because it's easier than his own - gives him a sense of being in control of something in a world that is not quite ready to put him in charge." "That's very perceptive of you," said Mrs. Ali, considering a moment. "What do we do to counteract this behavior?" "I'm considering running away to a quiet cottage in a secret location," said the Major, "and sending him news of my well-being by postcards forwarded on via Australia." She laughed. "Perhaps I may join you?" Major Pettigrew's Last Stand is full of moments such as this. There are other elements of life which are dealt with in this book. We see prejudice, in terms of both nationality and economic status. In addition to the adult children situation, there are other family problems, all too familiar to most people: jealousy between siblings, in-law concerns, and then the whole property dilemma. Who gets what and when? Do you sell off a future inheritance for cash now? What about the importance of 'things?' And there are worries about development in the little village. Major Pettigrew's Last Stand is a story filled with everyday truths; ones that I rarely consciously think of, but certainly recognized as I read them in print. It surprised him that his grief was sharper [his brother, younger by two years has just died of a sudden heart attack at 66] than in the past few days. He had forgotten that grief does not decline in a straight line or along a slow curve like a graph in a child's math book. [speaking of the dawn chorus] those birds perform a miracle every morning and the world ought to get up and listen. It was never a good idea to confide in people. They always remembered, and when they came up to you in the street, years later, you could see the information was still firmly attached to your face and present in the way they said your name and the pressure of their hand clasping yours. He should have telephoned before arriving. The fiction that he was welcome to drop in at any time, because he was family, could only be maintained as long as he never took Marjorie at her word. The book really encompases all the richness of life; the good, the not-so-good, the problems that can be solved and those which one must simply live with. It is utterly fair without judgments. It doesn't feel like the author had an agenda to promote. She tells the story and lets it flow with warmth and humor and deep humanity. I loved it beyond words. I would like to mention how much I enjoyed the print. This book was set in Caslon, a typeface first designed in 1722 by William Caslon. Its widespread used by most English printers in the early eighteenth century soon supplanted the Dutch typefaces that had formerly prevailed. The roman is considered a "workhorse" typeface due to its pleasant, open appearance, while the italic is exceedingly decorative. of the Persephone books. I am so put off by the Baskerville that I almost can't read the books. The Caslon is so clear, so lovely, so easy on the eyes that I don't even think about it, whereas when I read the P. books, I'm always aware of the print and how much I don't like it. And the cover is perfectly beautiful. It is complementary to the words inside. Oh, and I must mention that this is Helen Simonson's first book! These brownies are the April installment of Margaret's boyfriend's birthday present. They are really rich and delicious! Grease 9 x 13 pan with cooking spray. Add 1/3 cup melted butter and boiling water. Stir on low until it thickens. Mix well and pour into pan. Bake 30-35 minutes or until brownies pull away from sides. Watch carefully after 30 minutes so they don't over bake. Together with hummus and potato loaf, this is a dish we've been eating since we first became vegetarians. It is very different from regular cole slaw which I've found is often incredibly mayonnaise-y. I absolutely love this, and it is a powerhouse of healthy foods. Add this to the vegetables. This week I ordered seeds and plants for the vegetable garden. If you enjoy reading gardening literature, you'll know that most every piece of writing talks about seed catalogues; the joy of seeing them come in the mail in winter, the fun of going through them all and choosing your seeds or plants. Well, not me. I've been thinking about this a lot. Even when we first started gardening in 1973, and we'd pore over catalogues and make garden design graphs, it just felt like this was what we were 'supposed' to do. And all it did was give me anxiety. Too many choices, too much planning, too little fun. As the years have gone on, we've given up the plans. I don't look through a zillion catalogues anymore. I decide which companies I'm going to buy from and go online and order. And with our new raised beds the whole process is even simpler. We have only eight. One is for garlic which we plant in the fall. It is not a permanent bed - we change it each year. So that leaves seven beds to plant in. Last year we had quite a few flowers interspersed and while they were lovely, they did cut down on the food component. We have plenty of other places to grow flowers so this year those raised beds are just for vegetables. Sadly, I've given up growing peas. It is a lot of work and takes up a whole bed for maybe four meals a year. I dearly love those four meals, but the practical side of me says, let's try buying them at the Farmers' Market and use that space more efficiently. We've also given up our seed-starting venture. Again, too much work. The plants were never big enough when it was time to put them into the garden. I'd rather spend a bit more money and buy plants. I ordered onion sets and leek plants from Johnny's. I also get my summer squash/zucchini from there because this is the only place I can find Zephyr squash, my very favorite. I got Renegade spinach from there, along with Skyphos butterhead lettuce, and another I of course had to buy, Nancy's butterhead lettuce. They will send my Music garlic in the fall. In addition to Johnny's, I bought three packets of seeds from Renee's Garden: French Gold yellow beans, Sunshine orange and yellow carrots, and Merveille De Quatre Saisons lettuce, an old favorite of ours. I'm planning to buy some local tomato plants for another bed, and may put basil and parsley with it. The eighth bed is the aforementioned garlic. And the perennial chives have grown so much we'll be having them on potato loaf for supper tonight. I've begun raking flower gardens in this warm, sunny spring weather, and will hoe up any weeds in the raised beds soon. We'll put in some rotted manure, and we're on our way! The 'constant song sparrow' is back. I saw a phoebe flying into one of the nesting boxes under the eaves of the barn this morning. We've taken down the bird feeders since the local bears have come out of their winter homes. I posted about the situation two years ago. Last year when we came back after a day away, the bears had visited again, so this year we took them down before the bears showed up. 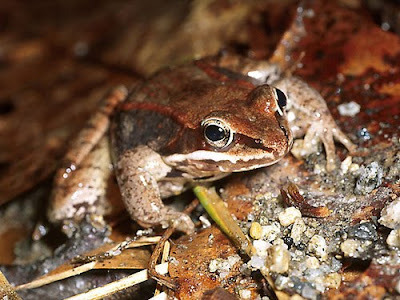 Lastly, we've heard the wood frogs in a couple areas where water collects on the farm. These are called vernal pools. They aren't really ponds because they dry up in summer, but they offer water for frogs in the spring. 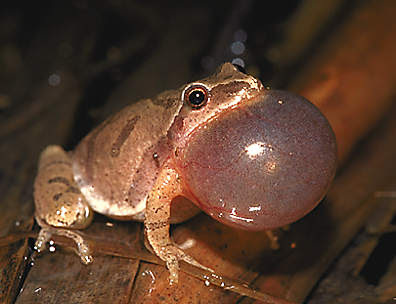 This is what the frogs sound like. And here is the little fellow.